Here are some excerpts from some of the most commonly asked questions as answered by our llama guru, “Domino”. Dear Domino, I am wondering, where do llamas come from, anyway? Though we llamas are getting more and more prevalent in the United States, we haven’t always lived here. Llamas come from South America, but geological evidence shows that llamas originated right here in North America about 40 million years ago. During the ice age they were forced to move. One group crossed the Bering Sea land bridge to Asia, evolving into the camel. The other group migrated to South America and settled in the high plains of Bolivia, Chile, and Peru, evolving into what is today the vicuna, the guanaco, the llama and the alpaca. The Incas used llamas as pack animals as far back as 6,000 years ago, ranking us among the world’s oldest domesticated animals. Dear Domino, Just how many llamas are there in the U.S.A.? We are becoming more and more popular, which is understandable, as we are such lovable animals. As recently as 1992 it was estimated that there were 30,000 llamas in the United States. Today we number around 200,000. Dear Domino, What can you do with a llama? Dear Domino, Do llamas make good pets? Lots of people want us as pets. Many people find that it’s hard to just have one, though. 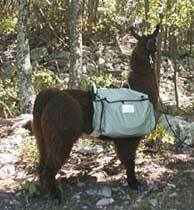 In fact, unless people want us to be a guard animal, we should always have a buddy llama. We are very social animals and we would be very lonely by ourselves. Dear Domino, How long do llamas live and how big do they get? The llama’s average lifespan is 15 to 25 years. We can get to be 3´ to 4´ high at the shoulder, and 5´ to 6 ½´ tall to the tops of our ears. On average we weigh from 250 to 450 pounds. Dear Domino, What colors do llamas come in? Oh, my! We come in every color imaginable. Well, I take that back. I’ve never seen a green or a blue llama. But llamas come in many colors and patterns ranging from white to black and many shades of gray, brown, beige, and reddish brown. 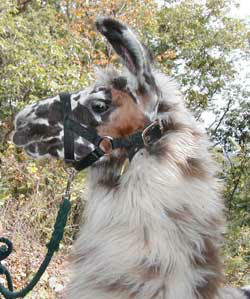 As you can see from my picture, I am a gorgeously spotted llama, commonly known as an appaloosa. My spots have shades of black, brown, gray, red and beige. Dear Domino, Are llamas smart? Ahem! Of course we are. We are very intelligent and easily trained. One of the techniques our people use with us is the "click and reward" method. When we perform a behavior correctly, they click a hand-held clicker and reward us with a little grain. I particularly like this technique, ‘cause I’m just crazy about that grain. This works better with some llamas than others. Santiago, our head guy, doesn't respond to this technique. He's extremely bright (I say stuck up), and it's almost as if he's saying, "I'm above being bribed to do that". Oh well, his loss, my grain, so to speak. Dear Domino, What kinds of sounds do llamas make? We llamas communicate by using various sounds as well as subtle positioning of our ears and tails. Humming. The most common sound we make is a soft hum. It sounds a lot like a person humming. We hum when we are concerned, curious or tired. Mothers also hum to greet their babies. Clucking. We often do this when greeting a new llama or as a warning to back off. It sounds like a person clicking their tongue against the roof of their mouth while keeping their mouth closed. Alarm Call. The other sound you might hear us make is our alarm call. We do this when we spot something suspicious, like a wild animal or stray dog. This sounds something like a combination between a horse whinny and a donkey bray. Santiago, the head guy, is always the one to sound the alarm call. He will run in the direction where he saw the intruder, and the rest of us follow close behind. We’ve chased a fox across the pasture before. We also have a lot of deer that have the audacity to jump into our pasture and graze on our grass. We’ve gotten used to them though and don’t give them a second thought. We do see our share of bears, though, and Santiago will sound the alarm call to warn us to be alert. They are just black bears, though, and probably wouldn’t dare to mess with us. We keep on our toes, though. And what about that spitting thing? Dear Domino, Do llamas spit? You know, everyone always asks me this question. I’m starting to fear we llamas are getting a bad reputation. Yes, llamas do spit. It’s perfectly natural. It’s how we establish rank within the herd, meaning who gets to the food dish first. Lady llamas often spit to ward off an unwanted suitor. 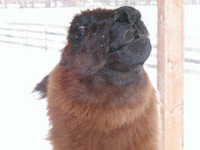 Spitting is also a very effective way to discipline our crias (baby llamas), and we spit to express fear or discomfort. Llamas do not usually spit at humans. Some of us, unfortunately, have been raised in petting zoos, where we are only around humans all day. These llamas view people as other llamas and may spit at a person that invades their space. We llamas usually give some kind of warning before we spit. First we’ll lay back our ears. If this doesn't make the point, we’ll pin back our ears very tightly and point our noses straight up in the air. As a final warning, we will spit in the air. Finally, we will spit directly at the llama or person that’s offending us. There are several kinds of spit. First, there is the grain spit. This is usually used to settle arguments over food. We just spit what we have in our mouths—usually dry grain. Then there is the saliva spit which is often a warning before the big green spit. The really serious spit is when we bring up the contents of our stomach and spit a foul smelling green spray. The smell is offensive both to the spitter as well as the spittee, after which both will hang their mouths open for several minutes in order to air out the taste and odor. A llama can spit with dead aim for a distance of 10 to 15 feet. This is my buddy, Santiago, reminding us that he gets first pick of the food dishes. Dear Domino, Do llamas kick or bite? No, we’re much too nice to do that. But seriously, llamas rarely kick. Even if we were to kick, we have padded feet, so the blow wouldn’t hurt as much as a kick from traditional livestock such as a horse. We don’t even have teeth on the upper front jaw, so we really can’t bite either. Dear Domino, Can you ride a llama? This is another question that I get asked a lot. People don’t usually ride llamas, and the reason is that we can’t carry the weight of a full grown person. Sometimes llamas are trained to carry very small children, but as a rule, we are never ridden. Dear Domino, Do llamas make good pack animals? Do we?!!! Absolutely, it’s what we were bred to do. In South America our traditional job was to pack supplies for the Incas. We are still used to carry supplies into areas too rugged to get a vehicle into. When we are fully grown, we can carry up to 25% to 30% of our body weight or a total of 75 to 115 lb. Because of the special design of our feet (a padded foot with 2 toenails) we have low impact on the trails. We are extremely sure-footed and agile, and can traverse difficult terrain that a horse could not negotiate. Besides, we are great company. People tell us that they feel very peaceful and relaxed when they hike with us. 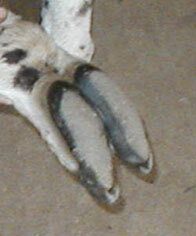 Dear Domino, You mentioned something about llamas having unique feet. What's so special about your feet, anyway? Llamas do not have hooves like horses or cows. Each foot is made up of 2 toes, each of which has a pad and a toenail. Here, I’ll lift up my front foot and show you. The bottom surface of the foot is mostly made up of the pad. The pad enables us to have more sensation and better contact with the ground. This makes us more surefooted and less damaging to the environment than any animal with hooves. Dear Domino, Do you shear a llama? Can you use their wool? We get sheared each spring. Primarily this helps us cope with the heat of the summer. But our wool is popular for spinning and felting. It is a hollow-core fiber, which makes it excellent for making warm clothing. It is also lanolin free, making it clean and easy to spin. Llama fiber can be used to make hats, scarves, sweaters, blankets, socks, and even fishing ties. Dear Domino, What do llamas like to eat? People refer to us as browsers. This means that we like a variety of grasses and leaves. We also eat hay and grain. They call us a modified ruminant and we chew our cud like a cow or sheep. This means we have a very efficient 3-chambered stomach which allows us to exist on all types of forage and also allows us to exist in the higher altitudes where plants are often sparse. Often in the fall, we will pass by tender green grass, and eat the dry, brown and crisp leaves that have fallen from the trees. This is our version of potato chips. Dear Domino, I know this is a delicate subject, but what are your toilet habits? Llamas urinate and defecate in communal dung piles also called potty piles. We usually have several potty piles around the pasture. This concentrates all the urine and feces in one place, leaving the rest of the area clean and dry for grazing..
Our dung is commonly referred to as "llama beans" and is in the form of small round pellets. Our highly efficient digestive system allows us to totally process our food for the maximum nutritional benefit. By the time it comes out, our dung is practically odorless and basically free of weed seeds. For this reason it makes a superb soil enhancer. (I refrain from calling it fertilizer, because then it requires a guaranteed chemical analysis.) What I will say is that "llama beans" are naturally high in nitrogen and will not burn plants. It does not need to be aged, and can be used on the garden directly from the llama. Llama manure is highly prized by master gardeners everywhere. It has the texture and odor of a rich potting soil or humus (great for in the house).